Those of us who aren’t pro athletes just can’t appreciate how critical foot and ankle health is. A little heel pain? It will pass…. You may think that professional athletic trainers are “babying” their players at times, but they know from experience that a seemingly innocuous, minor injury that’s left unattended, can develop into an injury which costs the team a championship, and end a player’s career. Geoff Schwarts is carted off the field Friday night. For instance, Geoff Schwartz, starting left guard for the New York Giants, was carted off the playing field last Friday night during their preseason game with the Jets. Trainers believed the toe was dislocated, but had no idea as to its severity. A dislocated toe is nothing to take lightly, because if serious enough, it can be a season-ending injury for an athlete. Fortunately for Schwartz, tests revealed that it’s only a minor dislocation which won’t require surgery. Geoff will be back on the field by the end of September if his rehab goes as planned. When the ligaments and tendons which hold the toe joint together are torn, the bones move apart and out of place. This is what’s called a dislocated toe. This can be a minor injury, as in Schwartz’s case, or quite severe, as when the toe is visibly out of joint. When the joint is properly realigned, it takes about 6 weeks for the ligaments to heal. How can you tell the difference between simply stubbing your toe, spraining it, breaking it, or dislocating it? You probably can’t, which is why you should see a podiatrist as soon as possible after you injure it. If the toe is dislocated, you’ll feel immediate, intense pain, extreme pain if you try and bend the toe, swelling, bruising, tenderness, or numbness, and possibly a very visible deformity. Some of these symptoms are also consistent with sprains and fractures, which is why a podiatrist’s opinion is necessary. Never – and we mean never, ever, ever try and “pop” the dislocated toe back into place by pulling on it. That’s strictly Hollywood stuff. A dislocated toe is frequently accompanied by a fracture, so if you pull on it, you can do a lot more damage. If you suspect that your toe has been dislocated, seek immediate medical attention from a podiatrist. He or she will take x-rays, make a diagnosis, and then if it is indeed dislocated, realign the toe and provide you with a walking boot to protect the toe while it heals. Physical therapy may also be recommended to get the toe back in shape after the ligaments heal. Take your foot and ankle health as seriously as pro athletes. The American Podiatric Medical Association has released a very illuminating survey on American’s attitudes and experiences concerning their foot health. The results are very surprising to us in some ways, and completely predictable in others, based on the patients we see. Unfortunately, your feet continue to rank low on the list of body parts you consider important to your well-being, and you’re paying less attention to them than you should. The survey, released in March, shows that 8 out of 10 of you have experienced foot pain at some time in your life. Those of you who’ve experienced foot pain on a regular basis, also report regular issues with other health complications, primarily back pain, eyesight issues (probably diabetes-related), arthritis or other joint pain, weight issues, knee pain, and heart and circulatory disorders. Half of you said that foot pain has restricted your activities in some way: walking, standing for long periods, exercising, sleeping, going to work, or playing with your children or grandchildren. You said that you understand how important foot health is, and that consistent or chronic foot pain can indicate other health problems. You also said that you understand what a complex mechanism the foot is and that a podiatrist is best qualified to treat your foot pain. You also reported that you have little knowledge of or experience with podiatrists. When a foot problem arises, you’re more likely to visit your primary care physician for help, or try and treat it on your own. But those of you who have visited a podiatrist give them high marks for care and are more satisfied with the outcome than those of you who were treated by your primary care physician. This last fact highlights a common misperception about the healthcare system – that your primary care physician is some kind of wizard who knows how to treat every conceivable ailment. While we respect our fellow physicians, every MD’s training is different. Primary care physicians are a sort of first line of defense and are trained to identify and treat the most common illnesses and complaints in the population. They’re also trained to flag unusual symptoms and to refer out injuries and disorders which are best treated by a specialist. Yet 60% of you say that you would talk to your PCP about a foot condition before seeking advice from a podiatrist (we understand however, that some insurance plans require this). Hello? Podiatrists know more about foot and ankle injuries and disorders than any other physician. When given the choice, always opt for a specialist. Shame on you: Only 32% of you report doing foot, ankle, or leg exercises to keep them strong, and only 43% wear proper, supportive footwear (that explains all of the comments/questions on our blog post about why your feet hurt). Speaking of footwear, 71% of women who wear high heels experience foot pain which they directly attribute to wearing high heels. Yet they own NINE PAIR (!). Unfortunatley, nearly 50% of you experiencing foot pain wait until it’s severe to see a podiatrist. Most of you don’t even consider a visit to a podiatrist for conditions like persistently sweaty or odorous feet, blisters, pain from high heels, hammertoes, problems with your toenails, or even diabetic wound care. Yet each of these conditions can indicate a more serious potential problem or set of problems. Treated early and properly by a podiatrist, your pain and discomfort can be relieved without further complications. In fact, 34% of you said that a podiatrist helped you identify other health issues such as diabetes, circulatory issues, or nerve damage. But what is up with the fact that only 74% of you report keeping your toenails trimmed? OMG! What are the other 26% of you doing? Do you have man servants to trim your toenails for you? Or extra long shoes to accommodate your lavishly long toenails? Click here to read the entire APMA survey. The theme music from Jaws starts playing in your head as your best friend goes about removing their shoes. Oh no. You take one last gasp of clean air and hold your breath as you quickly excuse yourself from the room, seeking the nearest gas mask. It may not as bad as all that, but why do some people’s feet create a bad (some might say deadly) odor and others don’t? The medical term for malodorous feet is Bromodosis, caused by a combination of sweat and bacteria. There are more than 250,000 sweat glands in each of our feet, making it one of the wettest parts of our body. In just 24 hours in fact, each foot might produce as much as one pint of sweat, especially if you exercise heavily. Certain medicines, stress, and medical conditions can also encourage excessive sweating, which is called hyperhidrosis. Hormonal changes are notorious for creating bromodosis, especially in teenagers and pregnant women. But sweat by itself doesn’t produce bad odor, as it’s simply water and salt and a few other elements your body is cleansing from your tissues. The problem is, it can’t evaporate, since it’s trapped behind a sock and shoe. If you sweat a lot, your feet stay damp and create conditions perfect for the real culprit: bacteria. Now understand that bacteria live all over your skin – it’s just one of those fun-facts-we’d-rather-not-know about our bodies(sorry!). And those bacteria are actually key to good health, as they discourage other more aggressive bacteria that can make us sick. Nice! Your feet smell for the same reason gourmet cheese does. That may be too much information for some, but we find it fascinating. You’ll never look at cheese and crackers the same way again. So what can you do to reduce your foot odor? If none of these remedies resolve your condition, visit our podiatry office, as we can treat your condition medically with injections and prescription medicines. Your friends and family will thank you. Should I see a Podiatrist or an Orthopedist? Your family physician just pointed to a dark line on your x-ray which shows a fracture of your ankle. She suggests you see a specialist, but will she recommend an Orthopedist or a Podiatrist? Which should you choose? An Orthopedist is devoted to the diagnosis and treatment of your entire body’s musculoskeletal system: the interworkings of the bones, muscles, tendons, ligaments and joints. Some orthopedists specialize in treating the foot and ankle, while others focus on hands, shoulders, spine, hips, etc. 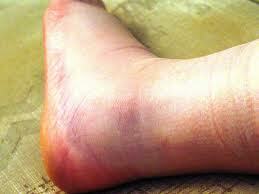 If you choose an orthopedist, make sure that they specialize in foot and ankle. A Podiatrist is a Doctor of Podiatric Medicine, who is trained intensively in the care of the feet, ankles, and lower legs. Podiatrists are also trained in the biomechanics of the foot and ankle and are trained to fit orthotics, custom shoes, braces, and similar devices. Additionally, some Podiatrists are Podiatric Surgeons, who can perform foot and ankle surgery in a hospital setting when necessary. A Doctor of Podiatric Medicine (DPM) is the foremost medical and surgical specialist of the foot and ankle and is the only medical specialist educated, trained, licensed, and certified for exclusive treatment of the foot and ankle. Podiatric Surgeons complete a 3 year hospital based residency which includes training in all aspects of foot and ankle surgery. There are some that choose to complete a 1 year fellowship to further focus on areas such as diabetic limb salvage or sports injuries of the foot and ankle. But not all Podiatrists choose to perform all types of foot and ankle surgery just as not all Orthopedic Surgeons choose to perform back surgery vs knee surgery. Just as with any physician, you should always make your choice based upon their reputation. The human foot and ankle is one of the most intricate and complex anatomical structures in your body, marrying the precision of a Swiss watch with the structural strength of a cantilever bridge. Your foot is a complex apparatus of 26 bones (one-quarter of all the bones in the human body), 33 joints and more than 100 ligaments and tendons, all linked and served by a vast network of nerves, muscles, blood vessels, soft tissue and skin. All of these parts work in unison to provide the support, strength, flexibility and resiliency needed for actions most of us take for granted, such as balance, walking, running and jumping. Podiatric surgeons provide comprehensive medical and surgical care for a wide variety of common and complex foot and ankle conditions that affect children, adults and the elderly. They are uniquely qualified to detect the early stages of diseases that show warning signs in the toes, foot, ankle or lower leg, such as diabetes, arthritis and cardiovascular disease. Early diagnosis and treatment by podiatric physicians may save patients from amputation, restore mobility or prevent other serious health problems.